Providing you the best range of screw capping machine, bottle capping machine, semi automatic capping machine, capping machine, lug capping machine and rotary capping machine with effective & timely delivery. 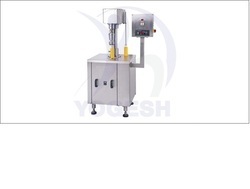 The semi automatic cap sealing machine is fabricated on the welded steel frame. The steel frame is enclosed with the stainless steel sheet with doors. For the Rotating head the motor is given. The machine seals the cap with proper uniform torque. 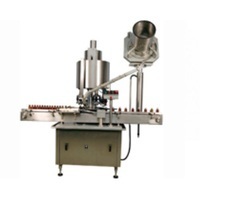 The manually filling containers are placed on the machine in such a way that the body and the neck are positioned below the rotating head. The uniform torque is providing to seal the cap. · S.S. cladding or hard chrome plating of all exposed parts. · The S.S. matt finish body, compact and versatile. · The bottle high gauge is adjustable for the quitting. · For the different size of the container, no need to change parts. We are instrumental in bringing a vast array of packing and filling Solutions including Semi Automatic Bottle Washing Filling that is suitable for washing bottles up to 1 litre. 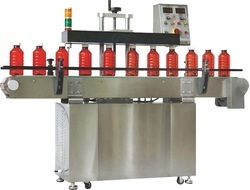 Offered machine effectively fills and caps bottles and offers a capacity of 15-20 bottles per minute. Available with manual loading and unloading, this machine is manufactured by our dexterous professionals who posses years of expertise in this field. Clients can avail this Semi Automatic Bottle Washing Filling from us in several technical specifications at most economical prices. A: Electric Motor for Pump. 1 HP 2800 RPM 440 Volts. The unit is made compact, enclosed in stainless steel elegantly mate / mirror finished body. Cam operated Syringes will draw correct volume of liquid and deliver it through tubes to nozzle. Longer life and good house keeping. Elegant and easy reach on / off switch for total control on operation. 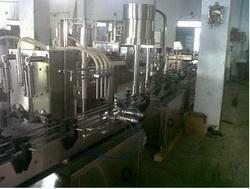 The automatic multi head ropp cap sealing machine is built on the welded steel frame enclosed in stainless steel sheet. The height of the machine can be adjusted by the adjustment system. The machine is self supported on stainless steel legs. The conveyor belt is used to move the containers. It feeds the containers in to the star wheel through in-feed worm. The containers are set below the sealing head in the subsequent indexing part, by the star wheel. The cap is picked by the bottle from the delivery chute of the cap filling bowl. The body and neck of the containers are positioned below the rotating head. The sealing head performs the operation of threading and sealing perfectly. · The storage capacity of the bowl is increased by the specially designed hopper. · For the easy and quick setting of the in-feed worm, the universal coupling is used. · The height of the conveyor belt is adjustable to align with other machine of the line. · For the different container diameter, no need to change the parts. · Head movement is by the motor. · Self lubricating UHMW-PE guide profile for S.S. slat chain. · Noise level and power consumption is very low. · No cap no container arrangement. · Motorized height adjustments system. No bottle no filing system.